Uninvolved and uninteresting run-throughs of many favorite violin encores by an artist who usually has much more to say. As an example consider the first track, Kreisler's noble and dashing Praeludium and Allegro, and hear the oddly disconnected way that Salerno-Sonnenberg plays the notes. To her, it's merely a succession of sounds and not a musical line. The remaining selections – with the possible exception of a lively Joplin Rag – get basically the same treatment. In contrast, Heifetz used to play these miniatures with great panache and wit – who can forget his carefree rendition of the Mozart Rondo transcription? Szeryng and Rabin, too, gave us wonderful versions of many of these pieces. 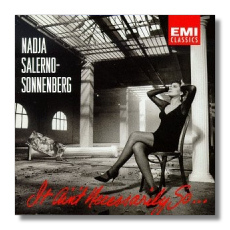 In any event, don't waste your hard-earned money on Salerno-Sonnenberg.